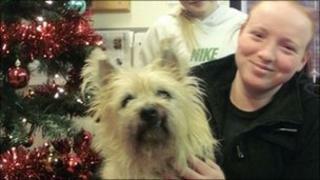 A dog which boarded a Glasgow bus in freezing conditions and refused to leave has been reunited with its owner. Cairn terrier Hamish had icicles on his coat when he boarded the bus on Wednesday in Dumbarton Road. He curled up in a warm spot and refused to move. The 11-year-old was taken to the Scottish SPCA's animal rescue and re-homing centre in Glasgow. He was later claimed by owner Ashley McGuinness after a relative heard radio reports of Hamish's antics. Ms McGuinness, from the city's Drumpchapel area, said: "My sister-in-law heard on the radio that the Scottish SPCA was looking for the owner of a cairn terrier who had gone on a bus and I thought it had to be Hamish. "He was out in the garden and I think he escaped by going under a fence. I was desperate to get him back home and I couldn't be happier." Centre assistant manager Anna O'Donnell said: "The passengers on the bus must have had a real surprise when Hamish decided to climb onboard. "Even in his short time with us he showed he was a cheeky wee character. "He certainly must have plenty of spirit about him, especially given his age, to have walked a few miles and then jumped on a bus. "We're just pleased to have been able to look after him and return him to his owner."